DK CHILDREN. Hardcover. GOOD. Spine creases, wear to binding and pages from reading. May contain limited notes, underlining or highlighting that does affect the text. Possible ex library copy, thatâll have the markings and stickers associated from the library. Accessories such as CD, codes, toys, may not be included. Dorling Kindersley Publishing, Incorporated, 2005. Hardcover. Good. Disclaimer:A copy that has been read, but remains in clean condition. All pages are intact, and the cover is intact. The spine may show signs of wear. Pages can include limited notes and highlighting, and the copy can include previous owner inscriptions. At ThriftBooks, our motto is: Read More, Spend Less.Dust jacket quality is not guaranteed. DK CHILDREN, 2005-09-19. Hardcover. Good. DK CHILDREN. Used - Good. Ships from the UK. Shows some signs of wear, and may have some markings on the inside. 100% Money Back Guarantee. Your purchase also supports literacy charities. 48 pages. Full colour illustrations throughout. In near new condition. Previous owners name on fly leaf. 1st American edition. 8 3/4" x 11". Weight: 14 oz. 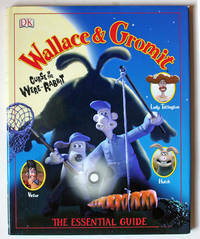 Enter the strange and wonderful world of Wallace the madcap inventor and his loyal dog Gromit. In this essential guide to the duo's feature-film debut, readers can follow this hilarious pair's delightful misadventures as they attempt to track down the beast that's been destroying the local vegetable gardens. New York: DK Publishing, Inc., 2005. 2005 Stated First American Edition, First Printing. NEAR FINE in VERY GOOD+ price-intact dust jacket. A crisp, clean, totally unmarked copy. One small corner crease at bottom of title page and a few light finger-dentings to text pages, very slight wear to cover edges - pages and hardcover are otherwise fine. Dust jacket, price intact on front flap, is clean and colorful - light rubbing at corners and spine ends, no tears or chips. Binding tight, book straight. A very giftable 1st edition! 8-3/4 x 11-1/4". 48 pages . First American Edition. Hard Cover. Near Fine/Very Good+. Illus. 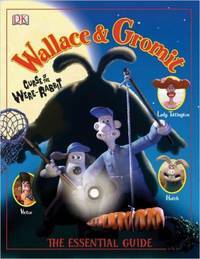 by Aardman Animation Ltd..
DK CHILDREN. Hardcover. 0756611539 Like New Condition. . Fine. 2005-06-08. Good. Ships with Tracking Number! INTERNATIONAL WORLDWIDE Shipping available. May not contain Access Codes or Supplements. May be ex-library. Shipping & Handling by region. Buy with confidence, excellent customer service! DK CHILDREN. Hardcover. 0756611539 New Condition. . New. DK CHILDREN, 2005-09-19. Hardcover. Used:Good.